Jaclyn Smith is an American actress and businesswoman, best known for her role as Kelly Garrett in the television series "Charlie’s Angels" (1976–1981). Smith became the only original female lead to remain with the series for its complete run. Despite her smooth career, fate had other thing waiting down her personal life, which had her encounter several challenges in life. Yes, the 73 years old lady had to surpass three tests with her ex-husbands until finally meeting the love of her life with the fourth one. Now she resides blissfully with her fourth husband and it's become over two decades since they tied the knot. Let's dig in more into the personal life of Jaclyn Smith including her marital relationship and past affairs. The American Businesswoman Jaclyn Smith has a distinct love life compared to other artists of her generation. She indeed indulged herself into a married relationship four times for finally achieving her best one. Jaclyn Smith and her husband Brad Allen. Now, out of her overindulgence in her career and keeping her fame aside, Jaclyn Smith gave herself a chance of calling a loving wife of Houston cardiothoracic surgeon Brad Allen since 1997. Reportedly, the duo tied the knot in a low key wedding ceremony, with the blessings received from their family and friends on October 11, 1997. Everything went fine, after all, there is no incident to point out bad about their lovey-dovey. "Twenty-one years later and I’m still a lucky girl." "My husband and I love to travel. And we like to go to places we’ve never been. Going the distance is great because you build a history together and memories." Smith met her future husband for the first time when he was working at Memorial Hermann Hospital in Houston. Allen was the one who operated her father and when she was leaving the hospital, her mother asked Allen to walk her to the car. "My mom didn’t want me walking down to the parking garage alone so he would walk me down. Who would’ve dreamed it could have happened?" Soon, the pair started dating and rest is all history. The actress, who successfully fought breast cancer in 2002 feels herself so blessed to have Allen as she insisted that he's truly the man of her dreams. "He’s kind and I saw a purity of heart. Looking back over time is wonderful." Down the line, she became the proud mother of two Spencer Margaret Richmond (born 1985), her daughter and Gaston Richmond (born 1982), her son. In fact, the two children of Jaclyn Smith are from her previous relationship with her third husband. Who was the unlucky guy to miss this beautiful lady? Firstly, Jaclyn Smith tied the knot with actor Roger Davis in 1968. But that didn't go well for both and citing irreconcilable differences the pair separated after seven years of the marital voyage. 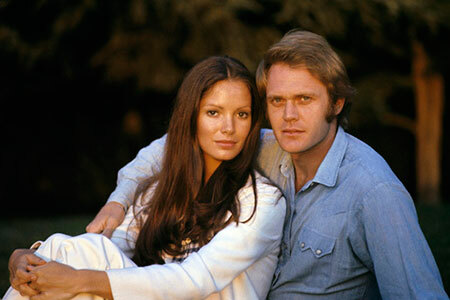 Jaclyn Smith and her ex-husband Roger Davis. Jaclyn called it quits with Roger in 1975. Jaclyn Smith and her ex-husband Dennis Cole. Similarly, she got hitched with Dennis Cole, an actor who appeared on Charlie’s Angels in 1977 and 1978. Jaclyn and her castmate turned spouse Dennis appeared on the show two times together before the couple divorced in 1981. Sad but true, Cole’s son from a previous marriage, Joe Cole, with whom Smith maintained a smooth relationship even after her divorce from his father, got murdered in 1991 during a robbery. The case, however, still remains unsolved. Jaclyn Smith and her ex-husband Tony Richmond. And prior to settling down with Brad, Smith walked down the aisle with third husband filmmaker Tony Richmond in 1981. Even more, she had faith in Tony which led both of them to become the proud parents of two children. Smith gave birth to Gaston, on March 19, 1982, and Spencer Margaret December 4, 1985. Later, Jaclyn and Tony also called it quits and divorced in 1989. Jaclyn Smith was born on October 26, 1945, in Houston, Texas, United States. She is the daughter of Margaret Ellen and Jack Smith. Jaclyn father was of Russian Jewish descent, and her mother had English, Scottish, Irish, and Welsh heritage. Smith graduated from Mirabeau B. Lamar High School and majored in psychology and drama at Trinity University in San Antonio. The 73 years old actress stands with a fair height of 5 ft 6 inches on the ground. As of 2019, Jaclyn Smith's estimated net worth is $90 million.